Did everyone have a good weekend? Yes? Okay. Phew. GOOD. This is the start of a new (short) storyline, and I’m testing out a new “cat’s tongue” brush. It’s made of the usual sable, but the bristles are very short and the lines can get kinda chunky. It’ll take some practice, but I think I’ll stick with it! 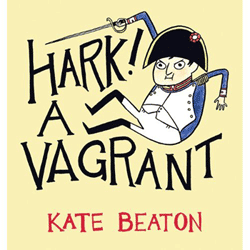 Tuesday, September 27th is the official release date of Kate Beaton‘s new Hark! A Vagrant book. I don’t talk much about Kate’s comics here because I assume most comics fans are already aware of them. But books need buyers in order to exist, and this is a particularly worthy book. Kate has an amazing talent at crafting things that appear practically effortless. And anyone who’s seen her process knows it’s far from the truth. Each joke is an elaborate construction; each drawing is a reflection of a constantly evolving cartoonist. 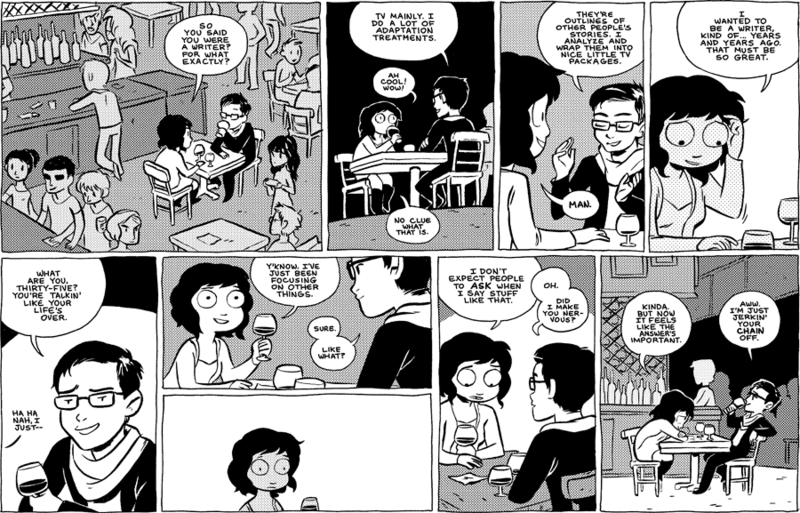 Yet the comics manage to delight with such spontaneity that any given strip can feel like a night out with friends. That is what makes Kate’s work so good, and so rare. Plus unlike a night with friends, they have excellent replay value. Which brings us back to why buying this collection is such a hot idea! As if you needed another reason, it’s also a gorgeously laid-out book, perfect for adorning even the fanciest of coffee tables. The guy in the third panel looks oddly realistic, more than is usual in this comic. And Eve, did you get your hair cut?! Nooooo!